← My DGAP article | Energiewende vs. USA Shale Gas: Can German industry compete? On 8 March, Raphael Ramirez, VP for Economy and President of PDVSA, announced that he had flown to China and Russia where he had secured extraordinary oil-linked loans totaling $7b. (Here is a video of the announcement, in Spanish, posted by El Mundo on 8 March 2014). In China’s case, its $5 billion loan is to be repayed with oil exports, and in Russia’s case, its $2 billion loan is said to be for development of a joint Russian-PDVSA Faja oil field. The government had delayed this market for lack of dollars to offer. The new Chinese and Russian loans have finally allowed it to act. However, another reason it was delayed for so long appears to be insufficient consensus between chavismo’s factions on how liberal a policy should be adopted. The policy now announced, if honestly implemented, is clearly a blow to the old commandist economic policies of Hugo Chavez and his long-time economic mentor, Jorge Giordani. In any case, getting these oil-backed loans from abroad, and pushing inside the government for a more market-oriented policy were made urgent by the growing protest movement. Then came the second of the administration’s economic measures to cope with unrest: President Maduro announced on 10 March a national food rationing card (see here and here), using citizen’s identity cards to limit shopping frequency. While this is a system to merely manage scarcity, it was presented as a way to prevent the supposed “sabotage” of the economy and “hoarding” orchestrated by the “oligarchy” that the state says is the real cause of shortages. In September 2013, Beijing flatly refused to extend cash to the Maduro administration to float Sicad 2. Chinese officials reportedly had refused to even watch the Powerpoint pitch that Maduro and Ramirez had prepared (see my post). But, now Ramirez suddenly has a new $5 billion loan from Beijing. Has the Maduro administration finally proven to Beijing’s satisfaction that it is financially competent? In the first place, Beijing rationally has concerns that protests could get out of control. So, it agreed, but under the rubric of the Fondo Chino, which must be repaid with PDVSA oil deliveries. This is more restrictive than what Maduro and Ramirez asked for in September 2013. But, there is likely another factor. Beijing has made strong demands upon chavismo in the past few years to improve its financial transparency, discipline and accountability. (See my posts on China’s frustrations.) Beijing was likely pleased with the new more-liberal version of Sicad 2, quite different from what had been discussed last year, and from previous institutions formed under Chavez, called “Cadivi” and “Sicad I. This time, the price paid for dollars is supposed to float. Just to clarify: Ramirez said both of the old institutions will continue. Cadivi will still offer subsidized dollars at 6.3 bolivar/dollar, and Sicad 1 at 11.8 b/d. Businesses importing certain vital necessities and others the state approves will still get these rates. It is not clear if these liberal characteristics of Sicad 2 were demands insisted upon by China, or if they come mainly at the initiative of the Maduro-Cabell0-Ramirez administration. Either way, they indicate that the demonstrations have finally begun to incentivize Maduro and Ramirez to push aside financial policies represented by Giordiani and other chavista hardliners. Further indication in this direction are recent rumors in Caracas that Ramirez might soon step aside as PDVSA president, in order, it was being said, to focus on his new work as VP for Economy which requires putting all his efforts into the internal factional struggle against the Giordani hardliners. Why would Beijing care about chavismo’s predicament? This is not to say that if the opposition were to come to power it would be anti-China. The realities of the global oil market, of increased oil production in the USA and Canada, etc., guarantee that China and East Asia will increasingly be Venezuela’s oil trading partners, no matter who is in power. Are matters getting out of Maduro’s control? The government’s plan depends on keeping demonstrations isolated to middle-class areas. However, many of the youth protesters demonstrating in middle-class areas of Caracas and other cities are actually impoverished youth from barrios who dare not protest openly in their own neighborhoods. There, the pro-chavista paramilitaries (so-called “collectivos”) patrol, enforcing allegiance to chavismo. The Tupamaros, of the high-rise 23 Enero barrio, are a prime example. In fact, they controlled this area long before Chavez was on the scene. In many middle-class areas residents give students shelter in their apartment buildings when such paramilitary gangs attack. So too, contacts have told me that local police forces in middle-class municipal boroughs (alcaldias) tend to protect students from national guardsmen and paramilitaries. These indicate dangerous confrontations, obviously of an armed nature, can easily take place, between different police forces, as seen in the killing of a state intelligence police officer by Chacao municipality police on 11 March. 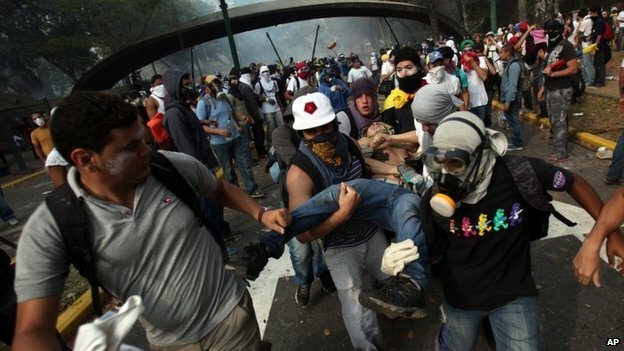 (See: 12mar14, Caracas Chronicles), and in other incidents. It has become clear that there are protests taking place also in barrios of the capital, where youth have set up barricades on a hit-and-run basis, residents have banged pots in concert during evenings to protest of government policies (cacerolazos), and at times more open protest actions occur. Though, indeed, the reports of relative calm there as compared to middle class areas are still generally accurate. It remains to be seen if the new Sicad 2 market and the rationing cards will significantly reverse the lack of imports and widespread shortages of food and other goods. Clearly, a floating value for dollars cuts the government costs for subsidizing dollars. And, while any rationing card might be resented, it also might reduce the lucrative resale of low-cost subsidized Venezuelan goods abroad–especially to Colombia–which has contributed to shortages. Nevertheless, the fundamentally unproductive character of the economy, both the non-oil sector, and the highly inefficient oil sector, is not being addressed, and life for Venezuelans in both middle-class and barrio areas will remain very difficult and complex. These economic measures may be far too little, too late. In which case, the chavista administration’s strategy of intensifying repression and waiting for demonstrations to burn out in isolation from barrios, may well backfire. This entry was posted in Chavez, Chavez lagacy, Chavez legacy, China, Faja of the Orinoco, Global Oil Market, heavy oil, Hugo Chávez, Institutions and rule of law, PDVSA, Uncategorized, Venezuela oil, Venezuela update, Venezuelan Democracy and tagged Beijing, Business and Economy, Caracas, Chavez, China, Energy, Heavy crude oil, Hugo Chávez, Nicolás Maduro, PDVSA, People's Republic of China. Bookmark the permalink.